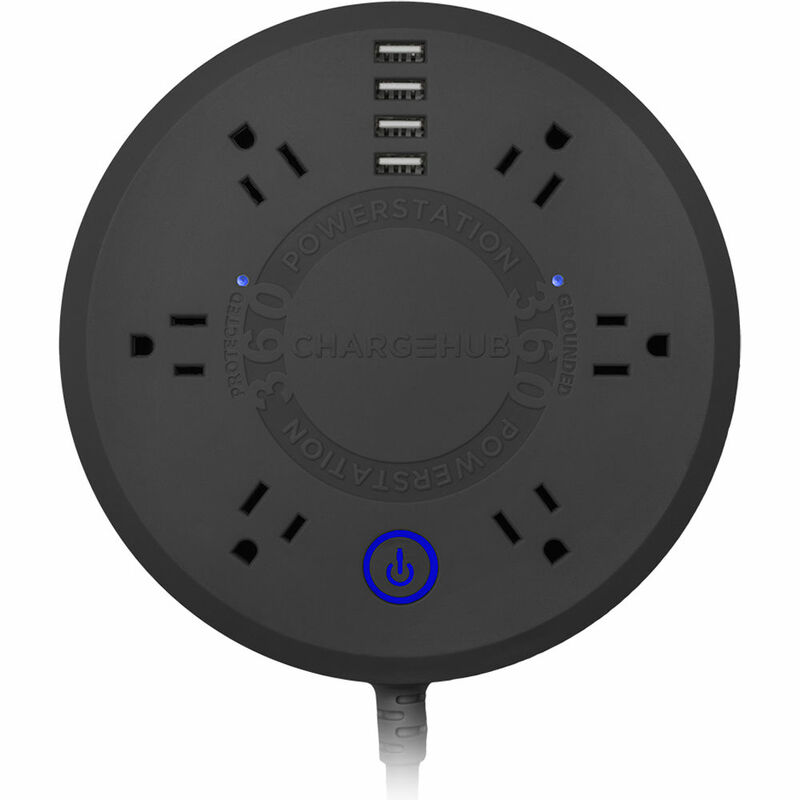 Charge up to 10 devices at once using a single wall outlet with the Powerstation 360 Surge Protector from ChargeHub. Equipped with six standard AC outlets and four USB charging ports, this black model of the wall-mountable Powerstation 360 boasts a textured, scratch-resistant finish and a circular design that can help keep your power cables organized. The Powerstation has an attached 6' power cord with a right-angle plug, plus 4000 joules of surge protection and a replaceable 10A / 250V fuse. In addition, the Powerstation's USB charging ports are designed to deliver an optimal charge by detecting the power needs of your connected devices. The Powerstation 360's 4000 joules of surge protection helps to ensure that all connected devices are safe from power fluctuations, spikes, and surges. The Powerstation also comes equipped with a replaceable 10A / 250V fuse, and a $75,000 lifetime connected equipment warranty is included. You can mount the Powerstation 360 on a wall with the provided screws, hanging template, and instructions. The Powerstation 360 uses patented SmartSpeed technology that's designed to provide an optimal charge for devices connected to the USB charging ports, up to 2.4A per port or 5A overall. The Powerstation 360's circular design can help keep your cables neat and organized. An LED indicator will light up when the Powerstation is plugged into a grounded outlet, while a second LED will illuminate when surge protection is active. Box Dimensions (LxWxH) 11.65 x 9.75 x 2.65"